Having rattled many a figurative comics cage in my blogging time in attempts to get publishers to take notice (and they didn’t), it is beyond gratifying to see Spider-Gwen #1 come to print. 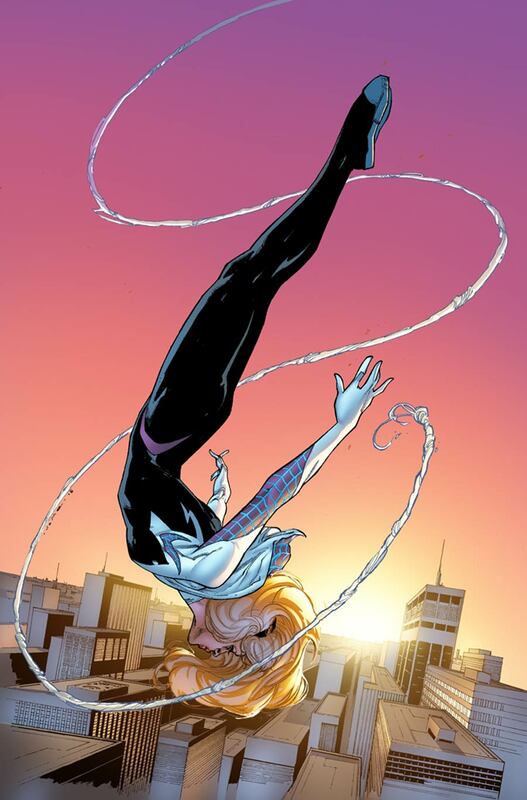 Last September, a spidey-powered Gwen Stacy graced the pages of Edge of the Spider-Verse #2 as just an alternate-world character, but the fan response was so overwhelmingly positive that Marvel gave Gwen her own book. What does that mean? Go buy this book! Make it a success so that the Big Two take heed to the call of their audience more often. By the way, it’s a worthwhile first issue so says Lindsey. Read her full review HERE. I am very anxious about this book. I am an old timer & I stopped buying Spidey when they killed Gwen waaaaay back there. I have looked in on occasion but it has never been on my regular pull list. I recoiled when they created the Norman/Gwen scenario. I had always pictured her as a strong young woman and would have the strength to resist Norman. I am eager to have her back in the MU.